Last Thursday, Business Insider published an article about Bill Gates’s statement of the coming revolutionary economic and social changes we will face in the next 20 years: ‘Bots are taking away jobs!’ Mechanic laborers, Gates posits, will be the cause of drastic adjustments in many different industry in regards to labor demand that will put many out of work. This philosophy is known as Neo-Luddism– the opposition to modern technology. Among the various reasons for this technophobic outlook are the industrial effects machines can have on employment. The influence of these workers and their unions’ fear of advancement in production can be seen in the many labor laws and make-work practices made into law. I never would’ve thought, however, that I would hear such aversion to technological improvement from the former CEO of Microsoft. But I would like to argue that all these are positive developments. I concede there will be some pains involved for certain workers in certain industries, which I will address later, and that jobs will initially be lost by some, but it will be worth it in the end. After all, where else have we heard the ‘stealing our jobs’ argument before: illegal immigrants. As I pointed out in this post, however, accepting more workers into our nation will help expand and improve our economy. In a very non-racist way, the robots are just like the Mexicans in this case because they free up workers who can then be allocated to industries in which they are more efficient, the machines are more productive, and it will ultimately benefit both the producer and consumer. The belief that machinery causes net unemployment and economic problems has been proven wrong time and time again. It all started back in one of my favorite eras of history: the Industrial Revolution, when the newly created labor-saving machinery of the time threatened the jobs of the textile workers, or so it seemed at the time. Sir Richard Arkwright had just created the spinning frame, which dramatically reduced the work needed to produce threads for yarn. The conventional spinning wheel needed one skilled operator to spin one thread. Arkwright’s new spinning frame, known as the water frame because it was water-powered, was so ingeniously invented in such a way that it took one unskilled operator to produce 128 threads at a time. Being right at the beginning of the Industrial Revolution, this had never happened before on such a large scale, and was bound to have a great effect on the economy. This efficiency, the workers believed, would cause massive unemployment. 128 people out of work for every one person kept– that’s more than 99% unemployment. 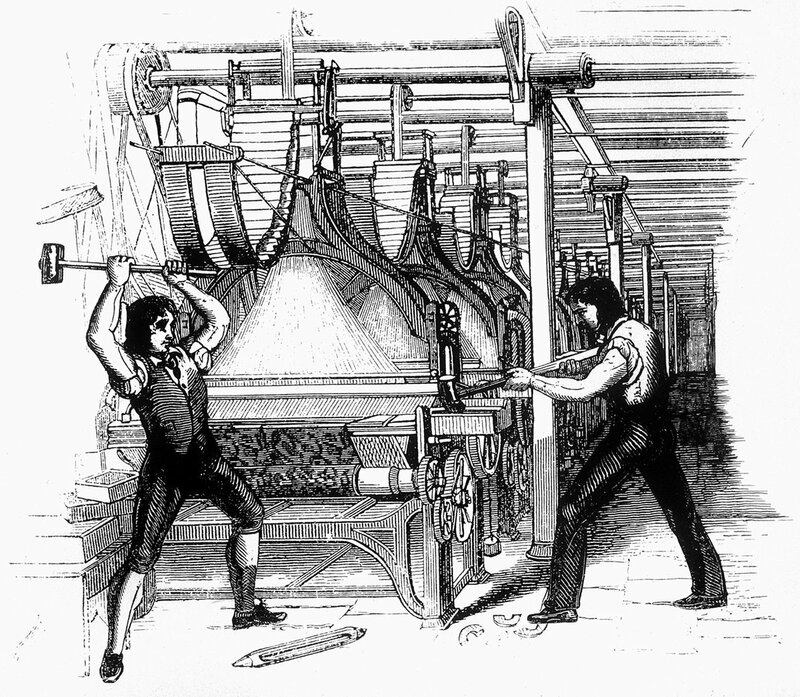 To protest this horrifying turn of events, stocking frames and other new equipment were smashed (see the picture above), factories destroyed, and Arkwright received many a death threat. Fortunately for the working class, however, technology and its effect on unemployment did not and does not work the way they thought, for instead of the expected result, employment actually increased 4,400% from 7,900 to 320,000 people! And the standard of living increased, too. Why is this? In his introduction to economics and most famous book Economics in One Lesson, Henry Hazlitt explains, in a chapter titled, “The Curse of Machinery”. Because of the scarcity of goods, people try to economize their resources to produce more efficiently and cost-effectively. They try to answer the question “How can I produce more for the same amount of labor?” To illustrate the effect of how a capitalist addresses this question, I shall artisan like the ones in the cotton-spinning industry mentioned above. A capitalist has, let’s say, 128 workers. Through his friend and business partner Sir Arkwright, he purchases a water frame, and drops all but one worker in his work force. Because of the new invention, both the 127 workers’ jobs and the capitalist’s investment in the old method of production and therefore the jobs of those workers are lost. This definitely look like unemployment in the short run, and it makes sense that the workers were scared of these new developments. Many of them had a hard time recovering financially. But to look at just the unemployment as permanent and a net loss is to be mistaken. Firstly, the very creation of the technology creates employment, or as George W. Bush so poetically put it, “When somebody makes a machine, it means there’s jobs at the machine-making place.” And often, labor-saving machinery requires a person to operate it. Since exchanges are only made if one values what they’re purchasing more than what they’re giving up, it would mean that the water frame’s work was worth more than the work of the people laid off. Once the profit from the thread produced by the water frame makes up its cost, that translates into profits. With the invention being more efficient than the workers’ labor, the capitalist gains more profits than he would before. Profits, with which he can do any or all of three things: use it to buy more machines to make more thread, invest, or consume, all of which increases employment in more industries. And the extra production and competition caused lead to lower prices, which passes the benefit unto the consumer. Because the consumers now have extra money they left over that they otherwise wouldn’t have had, they do the same three things the capitalist did, they invest in production, or they consume and invest in other aspects of the economy. This cycle continues, maximizing the production and profits of all involved and vitalizing the economy. Such innovation either increases production which increases wages, or lowers prices, increasing what one can buy with one’s wages. With all the government regulations and restrictions concerning labor and unions today, however, this becomes more difficult. Many relics of Franklin Roosevelt that damaged the economy and infringed on the right of employers and employees to make voluntary contracts are still present today. Despite this, technological innovation will raise the standards of living for all of society. So Mr. Gates, there’s no need to fear robotic labor. For when you follow that view to its conclusion, any piece of technology invented reduced employment, and caused economic stagnation. But this is not the case. When agriculture was pioneered and perfected, it freed up our ancestors from all needing to hunt and gather. It lead to and outburst in art, science, productivity, recreation, and higher quality of life. It lead to civilization. Imagine what the world will be like when labor is automated! Karl Marx’s vision where one can “do one thing today and another tomorrow, to hunt in the morning, fish in the afternoon, and rear cattle in the evening” can be realized, not through communism, but through the most capitalist process there is: production for a profit. UPDATE: I’d like to refer you to this article about protectionist policies at work. It concerns the legislation passed to limit the sales of Tesla Cars. It really makes it evident that it’s special interests, not just economic ignorance, that is the cause. Hopefully, it will end on a happier note, however. Over 70 economists and law professors have signed a letter opposing the anti-Tesla direct automobile distribution ban.